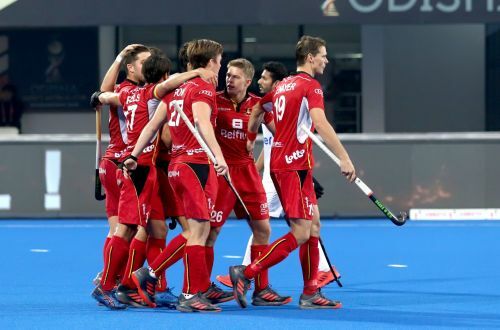 Belgium made short work of a lacklustre Pakistan to book their ticket for the quarter-finals of the Hockey World Cup 2018. They defeated Pakistan by 5-0 at the Kalinga Stadium in Bhubaneswar on Tuesday evening. Belgium are up to their real task when they face Germany two days later. But considering their performance, the Germans will endure a tough time to stop this talented Belgian bunch. The Olympic silver-medallist scored two goals in the first quarter. Alexander Hendrickx converted a penalty corner in the 10th minute. Three minutes later, captain Thomas Briels increased the margin after brilliant skills from Simon Gougnard. Thereafter, Belgium scored a goal in each of the three quarter. Cedric Charlier, Sebastien Dockier and Tom Boon registered their name on the score sheet. Belgium will now face Germany in the quarter-finals on Thursday. The intent was clear for this Belgium team before they took the field against Pakistan. Give no chance to your opponents to stage a comeback. As a result, the Belgian players started dominating from the first second of the match looking for an early goal. They got their first penalty corner in just 21 seconds but failed to utilise it. Belgium tried to hold the possession from the start. It didn’t take long for them to get on to the scoreboard. The second of the two back-to-back penalty corners was converted by their best person for the job Alexander Hendrickx. The Red Lions kept their momentum and looked for another goal. They got it through some fine work by Simon Gougnard, who found Thomas Briels on the edge of the goalmouth and the Belgium captain made no mistake. The two goals in the first quarter eased off some pressure of the Olympic silver-medallist team but they made it look like a practice match by scoring goals with ease and testing Pakistan defence on every available opportunity.